My rich dad taught me that the world is filled with different types of entrepreneurs. Building a profitable business is not easy, but there are ways to do it. I have assembled a team of specially trained experts in small business who can lend their experience in helping you grow your business. These experts – my Rich Dad Entrepreneur Coaches – work with you one on one to help you understand what you need to know to build a successful business. 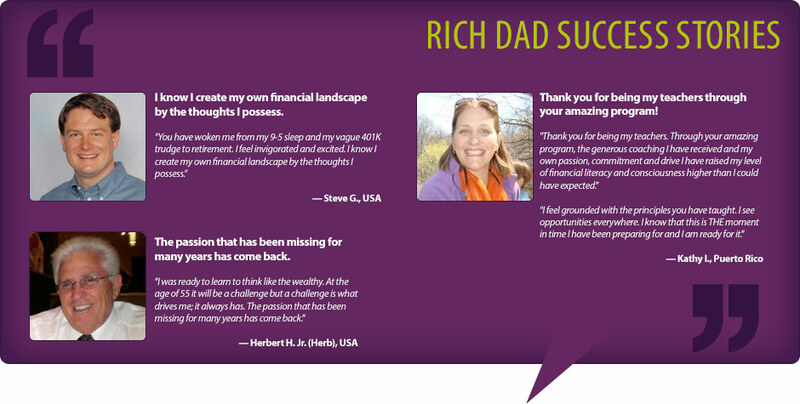 By submitting this form, you will be consenting to receive personal calls from Rich Dad Coaching to fulfill your request, at any phone number you provided, using automated technology. Please note your consent is not required to receive services from us, you can always call us at 1-800-240-0434 ext 5254.